For much of the 20th century, Spain was a country of emigration, with millions of its nationals moving to countries in the Americas and in North and Western Europe. In the 1980s, however, immigration to Spain began to pick up. Since then, the country has developed a legal framework for labor migration that features the active involvement of employers, trade unions, and regional governments. This report examines Spanish migration policies for low- and middle-skilled workers, and how these have changed as a result of fluctuating demand for immigrant labor. It also offers a profile of the country’s immigrant population, highlighting how Spain’s relationship with countries outside the European Union are reflected in its labor migration pathways and citizenship policies. The economic crisis that began in 2008 and its lingering effects—including pervasive high unemployment rates, particularly among young people—have put strain on this relatively young immigration system. Certain mechanisms, including parts of the Collective Management System that allows employers to recruit groups of workers, remain paused. And austerity cuts to national immigrant integration funding have left it to autonomous communities, provinces, and municipalities to take the lead in this area. Still, the country's approach to admitting workers from non-EU countries could inspire innovation at the EU level. In the years to come, top priorities for Spanish immigration policymakers will likely include addressing ongoing irregular migration, the arrival of increasing numbers of Venezuelans fleeing economic and political crisis, and—as sectors such as construction recover—how to adapt entry pathways and labor protections accordingly. IV. How Effective Have These Policies Been in Practice? A. 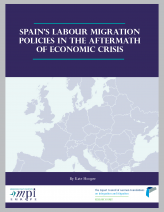 How Effective Was the Spanish Legal Migration System before the Economic Crisis? B. How Did the Crisis Reshape Spanish Immigration Priorities and Processes?